The cornerstone of the ultimate spa vacation is the treatment suite where you will be receiving your relaxing massage, facial, body wrap or bath. Choose from city spas with modern treatment rooms and suites, and resort spas where you can receive a massage outdoors and enjoy spectacular views. Plan a dream spa trip to a beach destination like Fiji, the Maldives or Thailand and get pampered from head to toe in a relaxing tropical setting. 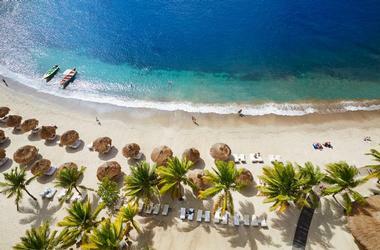 Uniquely designed treatment suites at Sugar Beach in St Lucia offer couples a calm setting for relaxing, surrounded by water. The private pond with a soothing waterfall will relax your mind while the skilled massage therapist makes the stress melt away from your body. You may also enjoy a treatment in a rainforest tree house. Sugar Beach, a Viceroy Resort is named after the beautiful sandy beach that fronts the hotel, quite appropriately called Sugar Beach. 100 acres of lush rainforest and a renovated 18th Century sugar plantation create a romantic setting in the Caribbean. The beach beckons with its white sand and views of the sea. Spend your days relaxing on the beach surrounded by pristine nature at this rainforest getaway. The resort offers beautiful villas, suites and Sugar Mill rooms with four-poster beds, personalized butler service and modern amenities. The villas and villa suites have stunning views of the Pitons or the Caribbean sea. Vacationers can indulge in relaxing treatments at the Rainforest Spa which was built in harmony with the surrounding rainforest. The spa has unique tree house treatment rooms and offers a menu of treatments that utilize local ingredients, such as coconut to exfoliate, aloe vera to rejuvenate and rich cocoa butter to hydrate. Spa facilities include seven traditionally built tree house treatment rooms, a relaxation pavilion, and an Amerindian steam dome—known as a temascal. The spa is a wonderful retreat for couples. Restaurants and bars offer a variety of Caribbean flavors and indoor and outdoor dining spaces. VacationIdea.com Tip: Ask about honeymoon packages which are often available. Rates start at $549 per night (758-456-8000). Escape to a private island in the Pacific for a vacation filled with spa treatments, romantic sunsets and relaxing time on the beach. The Wakaya Club & Spa has only 10 guest suites which means that privacy and luxury are virtually guaranteed. 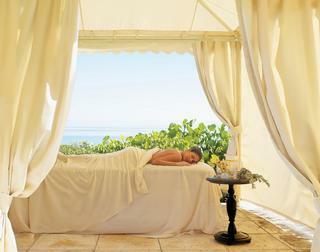 Breeze Spa is a beautiful retreat with ocean views, soothing pools and a diverse menu of treatments. Couples can book a specially designed retreat Breeze which has two treatment rooms, a salt-water serenity pool and a lanai. Enjoy two hours of spa treatments, followed by a light meal next to your own private pool with a view of the beach. The resort kitchen utilizes fruit and vegetables grown on the island. You will get to taste the freshest seafood, including lobster, shrimp, tuna and mahimahi. 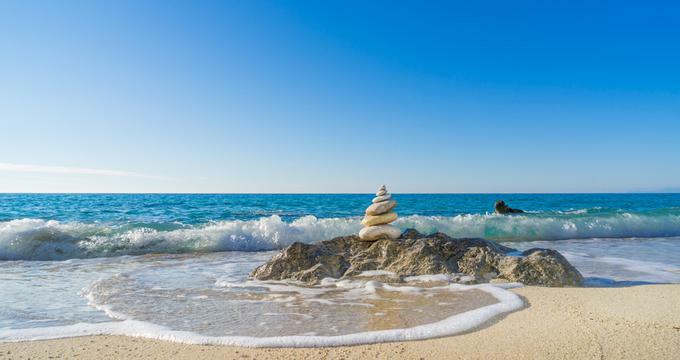 Once you are done relaxing at the spa, plan a secluded beach picnic and sunbathe on a private beach for the day. Or go on a group picnic featuring barbecue lunch and musical entertainment. Nightly rates start at US $1,900, including meals and transfers. 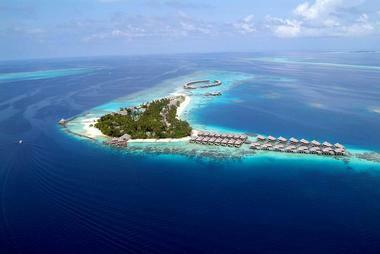 At Coco Bodu Hithi Maldives vacationers get a treatment over the water in specially designed rooms. The overwater fitness center lets you stay in shape on vacation. A tear-shaped private island in the middle of the Indian Ocean, Coco Bodu Hithi Maldives is a getaway for whose who love the ocean. The villas are built over the water with wooden steps leading into the pristine lagoon underneath. You can go snorkeling first thing in the morning and return to the villa for a delicious breakfast, followed by a romantic bath with a view. The property has 100 villas, all offering guests privacy, modern amenities, and Maldivian architecture with a high-pitched thatched roof. The luxury villas are situated on the beach or on stilts over the water. If you want your feet touching the sand all day long, book one of the beach houses. If you prefer to be surrounded by water, the Overwater Villas are the way to go. Enjoy spacious wooden decks with lounge chairs, private pools and magnificent views from every angle. Wake up in the morning and see the azure ocean surrounding your bed. Work out in an overwater fitness center and get a relaxing massage at the island spa. Treatments include hydrating facials, restorative relaxing massage rituals and beautifying body therapies. Watch open-air movies on the beach on a large screen under the starry night sky, with soothing ocean waves in the background. Spectacular snorkeling, scuba diving and other watersports are a favorite among adventure seekers. The island has a PADI certified dive school where you can learn to dive. Children over eight years old can take part in our Bubblemaker and Junior programs. There are many dining options, from romantic picnics to gourmet five star dinners. Nightly rates start at $672 per night. Exuding the luxurious style of a secluded Côte d’Azur retreat and the sun-drenched ambiance of Provençe, Auberge du Soleil has perfected the art of balancing wellness with luxurious indulgence. Boasting breathtaking Napa Valley views in a spectacular natural setting, the inn features a collection of beautifully appointed rooms and suites, featuring private terraces, cozy fireplaces and sensual elements such as private soaking tubs for two. The intimate retreat also offers the indulgent Auberge Spa, a gorgeous swimming pool and oversized chaises and gauze-draped day beds for lounging. Dine in style at the Michelin-rated Auberge du Soleil Restaurant, where Executive Chef Robert Curry presents beautifully prepared, Mediterranean-inspired Wine Country cuisine accompanied by some of Napa Valley’s finest wines. Exquisitely located in the heart of French Polynesia, the spectacular St Regis Bora Bora Resort epitomizes luxurious island living. Floating above the crystal clear waters of Bora Bora, Crusoe-chic style cabanas offer the ultimate in a private and intimate oceanside retreat. Rustic thatched living over-water cabanas and seaside villas are furnished with stylish contemporary décor and boast breathtaking ocean views. Designed to blend seamlessly with the stunning surrounding landscapes of sand and sea sun-bleached wood, sculptured stone, and delicate oceanic details echo a distinct Polynesian flavor. Beautiful en-suite bathrooms enjoy lavish Jacuzzi baths and unique outdoor showers and private terraces offer magnificent ocean views. 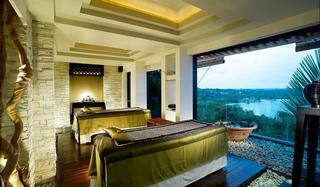 Unwind at the Miri Miri Spa by CLARINS or lounge by the beautiful swimming pool as you soak up the views. Dine at one of three restaurants, which have been designed to embrace the magnificent ocean views from every table or while away the hours by snorkeling or diving in Bora Bora’s gin-clear waters that teem with marine life and beautiful coral reefs. A huge outdoor bath is big enough for two and perfect for couples on their honeymoon. Epitomizing luxurious, barefoot living on one of the Seychelles’ most beautiful beaches, Banyan Tree Seychelles is an exclusive and secluded island escape. Just footsteps from the powder-soft sand, the Creole-style beach resort is an intimate retreat for those wanting an idyllic island getaway. Designed to reflect the Seychelles’ unique culture, beautifully appointed accommodation in the form of luxury villas offer comfort and luxury with spellbinding ocean views. Dappled shade from surrounding palm trees falls onto individual beach bungalows with designer en-suite bedrooms, beautiful bathrooms with soaking tubs and Amazon showers and a range of deluxe amenities. Award-winning chefs bring an array of exquisite international cuisine to diners, with lavish buffets piled high with fresh seafood pulled straight from the sea and a range of other international cuisine. Whether the gentle wash of the waves on the shore draws you to the ocean or the idea of relaxing in a hammock with a book is your idea of a perfect holiday, Banyan Tree Seychelles will pamper your senses in every way. 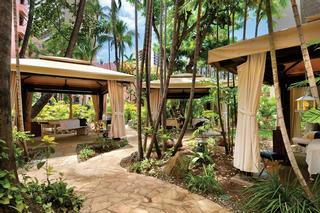 Affectionately known as ‘The Pink Palace,' The Royal Hawaiian is an elegant oasis in the heart of Waikiki. Embracing spellbinding views of Diamond Head Crater and a mere stone’s throw away from the beach, this evocative retreat is paradise found. Innovative design combines with sophisticated glamor to offer guests luxurious oceanfront living in the form of 528 exquisitely appointed rooms and suites. Tangible sea views float through open-plan living spaces and out onto broad, embracing terraces that seem to flow effortlessly into the sea, and modern amenities abound. First class facilities abound with a stunning swimming pool that appears to float into the ocean, and the exclusive Abhasa Spa, where guests can indulge in a traditional Lomi Lomi massage in luxurious 'suite style' treatment rooms in a beautiful garden setting. Dining is an unforgettable experience – head to Azure for fine dining and fantastic views or try The Royal Hawaiian Luau – Aha ‘Aina for an unforgettable epicurean journey. If you feel like something more relaxed and laid back, Surf Lanai offers excellent beach bar style fare and the Mai Tai Bar is the best spot for sundowner cocktails or a glass of bubbly. This ultra luxe treament room at Sandy Lane resort in Barbados has high ceilings, giant candles that create a romantic ambiance and a private jacuzzi outside in the garden. Sandy Lane is a beautiful family-friendly Caribbean resort located in St. James in Barbados. The luxury resort first opened its doors in 1961 and has been an island favorite ever since. If you are looking for a grand place to stay, play scenic golf and enjoy pampering massages at the spa, check into Sandy Lane. Guests are accommodated in lavishly furnished rooms and suites which will make you feel like you've just arrived to a grand private estate. The resort has a large percentage of returning guests who fall in love with its classical ambiance and attentive staff. The property has been featured in our article 12 Best Family Beach Resorts with Kids' Program because of its unique offerings for younger guests. Families are especially fond of Sandy Lane during the holiday periods when special programs and fun events keep kids happy and entertained. There is a club for teens who sometimes prove to be the most demanding guests. They will have a chance to participate in age-appropriate activities and meet their peers. The resort spa is not to be missed, offering treatments inspired by different healing philosophies from around the world. Whether you are a fan of Ayurvedic treatments or European traditions, there will be items on the spa menu which will meet your expectations. Stay fit on vacation by working out at the gym which offers free weights, rowers, bikes and other equipment. Play tennis outdoors or choose from a variety of water sports on the beach. The hotel offers a variety of elegant dining options. L'Acajou is an amazing spot for romantic sunsets which can be admired from the candlelit terrace. The restaurant serves European dishes and offers an extensive wine collection. For a more casual beachfront lunch, head to Bajan Blue. The eatery also serves an amazing Sunday Brunch which is popular with locals and visitors alike. Themed buffet evenings are well worth a visit as well. For healthy, low-calorie options, head to the Spa Cafe which serves soups and light main courses. You can also just grab a smoothie and relax next to the sounds of the waterfall at the cafe. Rates start from USD $1,000 per night. Look for seasonal packages and deals, as well as special events like workshops with famous athletes (246-444-2000). Surrounded by lush, landscaped gardens on the beautiful white sands of Tanjung Said Bay overlooking the South China Sea, Banyan Tree Bintan Resort and Spa is a luxurious and tranquil beach resort in the heart Indonesia’s Riau Archipelago. Bordered by breathtakingly blue waters lapping golden-sanded beaches, this tropical retreat enjoys panoramic views of Said Bay and combining traditional Indonesian design with a taste of modern luxury, Banyan Tree Bintan promises a secluded and intimate island escape. Inspired by Indonesia’s rich cultural heritage, superior guest suites boast spacious en-suite bathrooms with soaking tubs and walk-in showers and deluxe amenities, including fully stocked mini bars, satellite television, and air-conditioning. Luxuriate in the comfort of a Rainforest Sea View Room, decorated with rich woods, exotic fabrics, and exquisite Sabah-inspired furnishings, and boasting a private balcony with magnificent views. Enjoy an array of Asian delicacies at Treetops; head to Saffron for fine dining with a contemporary-chic Thai ambience; or toast the setting sun with a colorful cocktail from the iconic Beach Pool Bar as you look out over the South China Sea. The exclusive Bintan Tree Spa offers a variety of pampering body and facial treatments on a private spa island, or simply lounge by the sparkling swimming pool with a drink as you soak up the breath-taking surroundings. Capri Palace Hotel and Spa is located on Capri, a beautiful Italian island. The getaway, popular with celebrity guests, features an innovative full service spa, a heated swimming pool, a fitness room and delicious Mediterranean food. Guests can enjoy classical architecture and Louis XVI style furnishings. 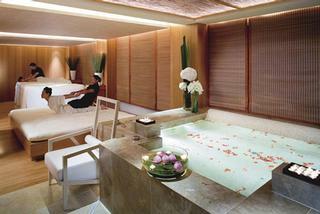 The spa offers a range of innovative beauty programs. Treatments include hydrotherapy with marine algae, lymphatic drainage, mud baths, facials and aromatherapy. 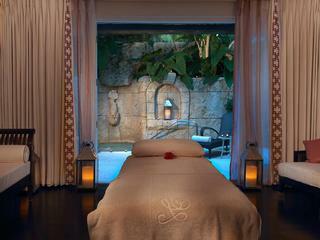 Guests can choose from single spa sessions to week-long beauty spa getaways. If you like to spend time out at sea, the hotel offers a high-powered motorboat and sailboat rental. 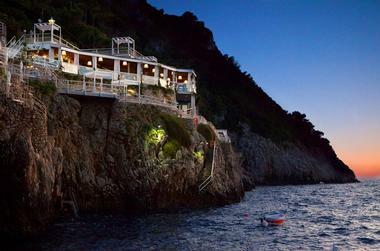 Other activities include tennis at the Capri Sporting Club, hiking, nature walks and boutique shopping. There are 77 guest rooms and 11 luxury suites. Four of the rooms have their own private garden and a heated swimming pool if you are looking for the ultimate indulgence. Dining is offered at three hotel restaurants, including L'Olivo, La Terazza and La Piscina. Enjoy the flavorful Mediterranean food, wine, homemade bread, pasta and deserts. The property is located near Villa San Michele and the chair lift to Monte Solaro. The nearby village of Anacapri offers local shops and small village atmosphere. Summer is the best time to enjoy sunbathing and warm island climate. In May, June and September, there are fewer tourists than during the peak summer months, so you can ask about specials. The property is closed from November through March. There is nearby heliport, enabling a fast transfer from the Naples International Airport. Doubles from Euro 295 per night during the low season (April, October) and from Euro 400 during the high season. 7-day beauty programs start from Euro 2,324 (+39-081-9780111). Exuding style and sophistication on the tranquil shores of Paradise Island in the Bahamas, One & Only Ocean Club is a study in luxury and refinement with breathtaking ocean views that is amongst the best in the world. Merging Bahamian beach chic with the polished sophistication of a private estate, One & Only Ocean Club hits all the right notes with tranquil, leafy gardens, immaculately decorated rooms, and comfortable loungers overlooking an indigo swimming pool. Beautifully appointed rooms and suites enjoy modern, contemporary chic interiors, along with first-class facilities and state-of-the-art amenities, including LCD TVs, iPod docks and complimentary wireless internet access. Large windows command spectacular views while beautiful terrazzo bathrooms will delight with luxurious soaking tubs and Amazon rain showers. One & Only Spa is the perfect place to unwind with luxurious treatment rooms with terraces overlooking a beautifully landscaped tropical garden and access to the hotel’s outdoor swimming pool. Experience fine dining at Dune, where you can savor an exotic fusion of traditional and international flavors created by Michelin-starred Chef Jean-Georges Vongerichten. Enjoy a drink at the cool, grey-hued Pool Terrace Café, which overlooks the inner courtyard or sip a smoothie at the poolside bar as you soak up some sun. East meets West at The Landmark Mandarin Oriental which boasts sophisticated style, legendary service and breath-taking views of Hong Kong’s glinting skyline. Overlooking the bustling Victoria Harbour, this elegant five-star hotel is a landmark in the heart of the city with exquisitely appointed guest rooms and suites, award-winning restaurants and deluxe facilities. Spacious and elegant en-suite rooms feature floor-to-ceiling windows with panoramic city and harbor views, while modern amenities include iPod docking stations, flat-screen TVs, and minibars. The exclusive spa, regarded as one of the best in the world, offers traditional Chinese and Ayurvedic treatments, as well as first class spa facilities, including steam room and Jacuzzi or heated indoor swimming pool. Savor outstanding cuisine from the fine dining Amber Restaurant or enjoy champagne and cocktails from MO Bar with beautiful city views. 25 Unique Luxury Hotels in Washington, D.C.